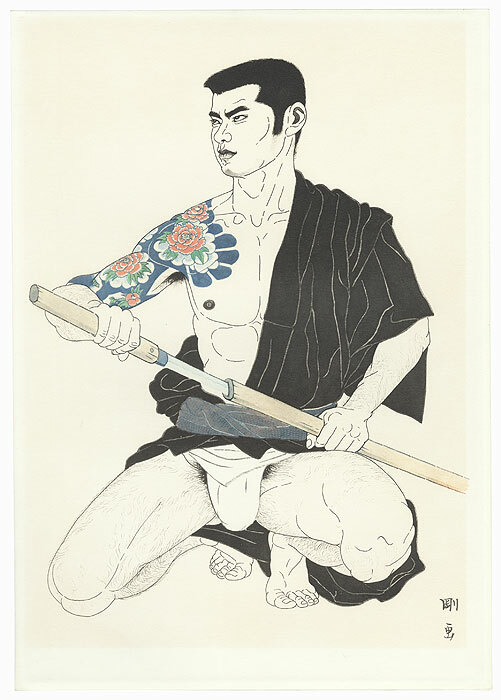 Go Mishima - Tsuyoshi Mishima, who worked under the name of Go Mishima, was one of the first contemporary gay artists in Japan. He contributed illustrations to "Barazoku" (The Rose Tribe), the first commercial gay magazine in Japan, published by Daini Shobo in Tokyo in 1971. In 1974, Mishima founded his own gay magazine called "Sabu." 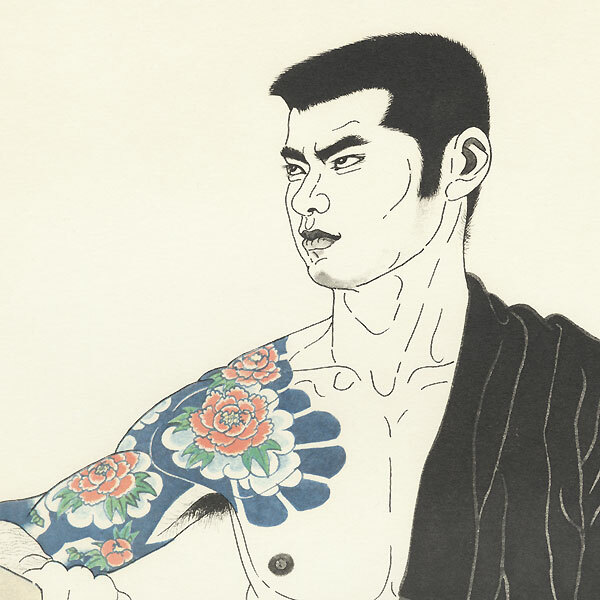 Mishima also created a series of lithograph portraits of young men with tattoos titled "Mishima Go Book of Young Men" (Mishima Go gashu wakamono) in 1972. Printed by Daini Shobo, the series was a portfolio of 24 portraits. Considered gay erotica, his images feature rugged young men with short cropped hair and impressive full body tattoos. Works by Go Mishima are extremely rare, and this is the first time we've come across them. 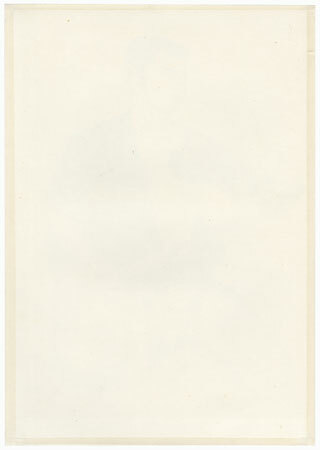 A rare chance to acquire a print by this noted artist of the genre. Image Size - Page size 16 1/2" x 11 5/8"
Condition - This print with excellent color and detail as shown. Paper remnants on reverse at edges from previous mounting. Light toning. Please see photos for details. Good overall.